When Bruce Rauner was running for Governor, his political opponents (especially on the right) criticized him for his friendship with Chicago Mayor Rahm Emanuel. That criticism was fueled in part by political opportunism, but also from a real fear that Rauner would ignore the will of the electorate and scheme with Emanuel to divvy up power between them. So much for that. 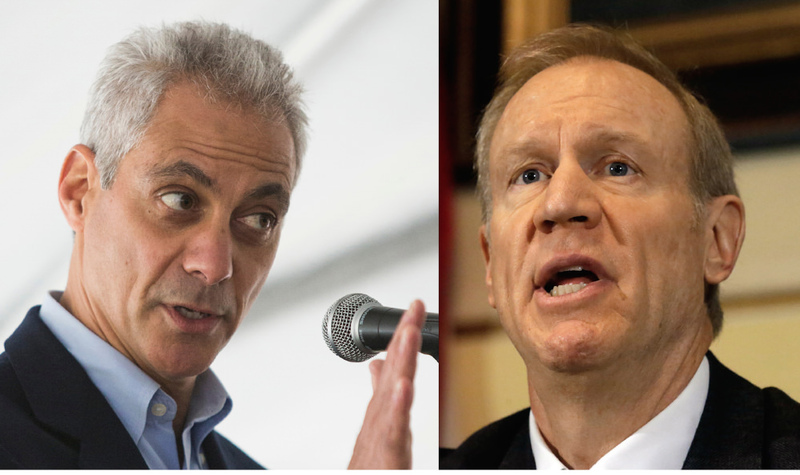 Today the pair are more like heavyweights doing battle in the ring, with now Governor Rauner pummeling Rahm to a standing eight count. Here’s the blow by blow: On Monday, Rauner slammed the Mayor’s egregious handling of the Chicago Police Department, and made it clear that there will be no bail out for Chicago Public Schools (CPS) unless Emanuel takes on some of the Governor’s reform agenda. Thus, Rauner deftly cut the thin skinned Emanuel on his failure to do the two things a Mayor must do: protect and educate the city’s residents. On Tuesday, a bruised and battered Mayor Emanuel flailed away, charging Rauner with failing CPS students, an irony that would be laughable if it wasn’t so sad. Under Rahm’s leadership, CPS’ bond rating has fallen to junk status, and the district fails to bring the majority of 400,000 students to grade-level achievement each year. Taxpayers and businesses – the bodies who fund state government – have left in droves since a feckless Governor Quinn signed off on the 2011 tax hike. The problem, as Rauner has argued, is that the state is dysfunctional. The whole system is wildly broken and it needs to be structurally reformed. Emanuel, like Illinois House Speaker Mike Madigan, seems to lack either the ability or willingness to acknowledge this reality. Funding a $111 billion (and growing) pension liability by raising taxes on a shrinking tax base is not reality. Running the state effectively on a budget that is $4 billion out of balance is not reality. Expecting that businesses will move into a city that makes no secret of its intention to pick them clean in order to fund its failing public systems is not reality. Consequently, this fight between Rauner and Emanuel is more than just political theater – it is a signal of the tipping point to come. The next eleven months until election day will determine the viability of the City of Chicago, the State of Illinois, and both political parties in their current form. The demographics of this state are rapidly changing. As are technology and the public’s access to and demand for information. Voters are exhausted by the economic burdens placed on them from an extortionist political class. This is gut-check time in Illinois politics. And so politicians must ask themselves: Are we willing to champion the new Chicago, the new Illinois that is relentlessly rising around us, or are we the dying wail of the old “Chicago Way” that – once gone – is never coming back? When faced with decisions this stark, and consequences this immense, members of the political class are not going to be able to get away with standing outside the fray and being a little bit on both sides. In other words, ruling class politicians, whose corner are you in: Rauner’s or Rahm’s?